Icon magazine asked us to contribute to their monthly “Rethink” feature, where current and commonplace objects are re-imagined. 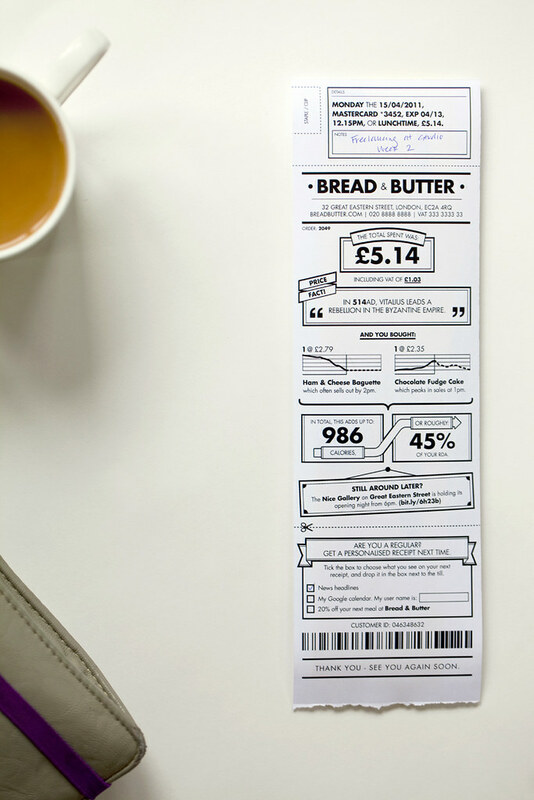 We’ve added semi-useful info-visualisation of the foods ordered based on “what the till knows” – sparklines, trends – and low-tech personalisation of information that might be useful to regulars. Customers can select events or news stories they are interested in by ticking a check box. 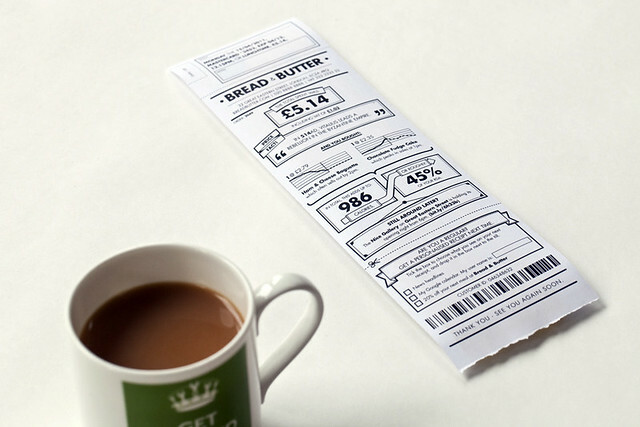 We think the humble receipt could be something like a paper “app” and be valuable in small and playful ways. Read all about it in this month’s Icon #97, available at all good newsagents! 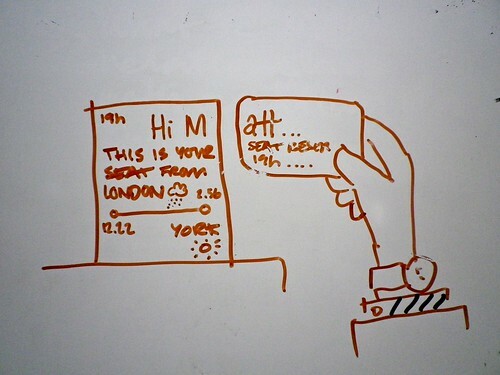 “The Journey” is the second ‘video sketch’ in the pair with ‘Incidental Media’ – this time looking at the panoply of screens and media surfaces in a train station, and the opportunities that could come from looking at them slightly differently. There’s no real new technology at play in any of these ideas, just different connections and flows of information being made in the background – quietly, gradually changing how screens, bits of print ephemera such as train tickets, and objects in the world can inter-relate to make someone’s journey that bit less stressful, that bit more delightful. There’s a lot in there – so I wanted to unpack a few of the moments in the film in this (rather long!) blog post and examine them a bit. 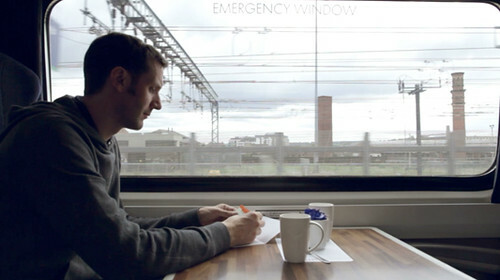 The film can be divided into two halves – our time in the station, and our time on the train. The first group of interventions could be characterised as the station wrapping around you, helping you get to your seat, on your train, for your journey, with the least stress. 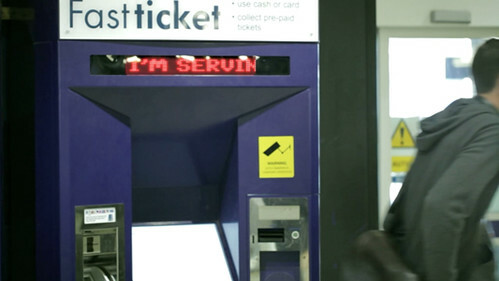 Let’s start at the ticket machine. 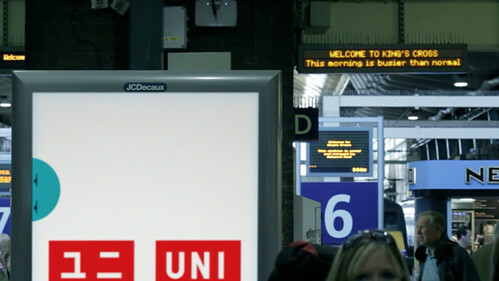 The screen supposes two things – that it knows where it is (it doesn’t move around much) and it knows where your train (in this case, “Arthur” – trains are people too!) is leaving from, and when. So why not do a simple bit of reassurance here? It’s twenty minutes to Arthur’s departure and it’s a 3 minute walk. There’s the screen we’ve been interacting with to get our ticket, but there’s also a LED scroller above that. 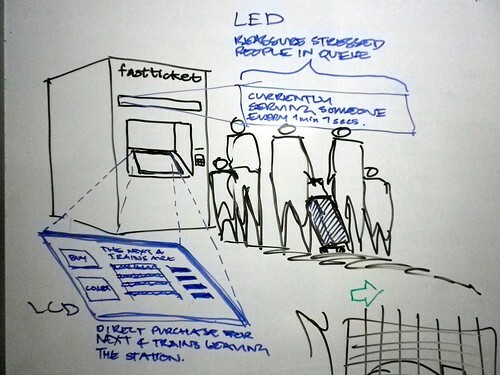 As you can see in the concept sketch below, we’ve supposed that the scroller could give reassurance to the people in the queue behind you – maybe displaying the average turn-around-time of serving tickets to travellers, so if there is a queue, you’ll know how quickly it might move. I think when I was drawing this I had in mind the awesome-but-as-yet-unrealised scheme by Lisa Strausfeld and Pentagram NYC for a videowall in Penn Station. I think I first saw this presented by Lisa Strausfeld at a conference some 8 or so years ago now, but it’s still wonderful. 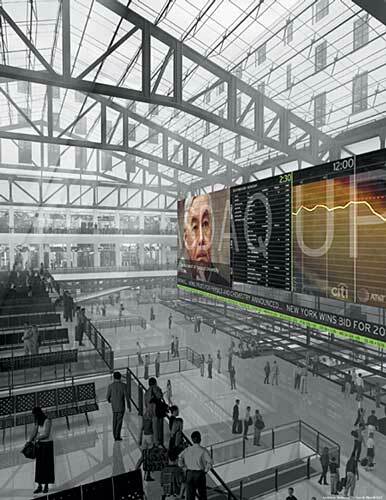 The large video wall has loads of different layers of information kind of interpolated and displayed all at once, at different ‘resolutions’. So that if you’re approaching the station from down the street you read some overall information about the running of the station that day, and the time, and as you get closer you see news and stock prices, then closer again and you actually see the train times when you get close enough to crane your neck up at them. Really clever, and a huge influence on us. The notion of several ‘reads’ of the information being presented on the same surface – if handled well, as in the Pentagram proposal – can be very powerful. 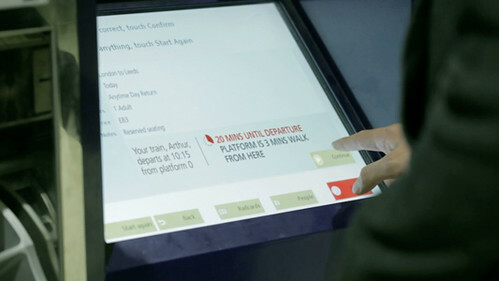 We’ve taken a much less high-tech approach, using the multitude of existing screens in the station, but staging the information they present intelligently in a similar way as you approach the platform and your train itself. We’ve hinted in this image at a little bit of nice speculative quiet new technology that could be placed by the station workers: magnetically-backed e-ink signs – again displaying reassuring information about where the busy portions of the train will be. If not, it doesn’t matter. It’s not a functional improvement to your journey but these touches lead to an appreciation of the service’s scale or reach and, if you are a regular traveller, inject a bit of recognition and delight into the otherwise routine. Once onboard, we continue to explore opportunities for these incidental, different reads of information to both inform and delight. 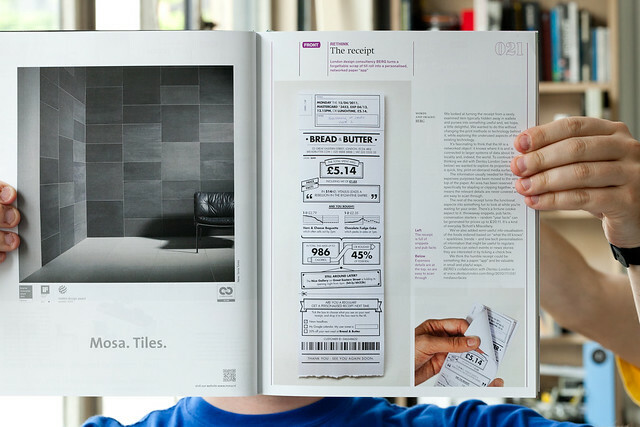 In the first film ‘Incidental Media’, we introduce the concept of “Print can be quick” – looking at all the printed ephemera around us and how it can be treated as a media surface for more personalised, contextualised or rapidly-updated information. After all, most of the printed matter associated with a train journey is truly print-on-demand: your tickets, your receipts and, as in this example, the printed reservation stub placed on the seat by the train attendants. Here we wanted to look to the reassurances and reads that one takes of the reservation stubs as you move down the carriage – either with a reserved seat to find, or perhaps without a reservation on a busy train, opportunistically looking for an unoccupied seat that might be reserved for a latter portion of the train’s total journey. In one of our concept sketches below we’re exploring that first case – could your ticket be the missing jigsaw piece to the reservation stub? A bit Willy Wonka magic ticket! Privacy would be preserved by just using your first initial – printed large with salutations, attracting your eye easily to zero in on your seat as perhaps you struggle down the aisle with your baggage. 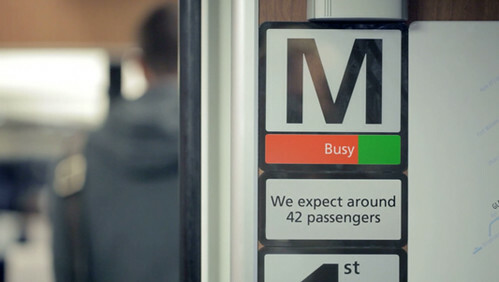 The final version used in the film takes this on board, but balances it a little more with the second use-case, that of the opportunistic search for a free seat by someone without a reservation. To answer that case, the portion of the journey that the seat is occupied for is clearly legible, whereas the initials of the traveller are only visible on scrutiny. 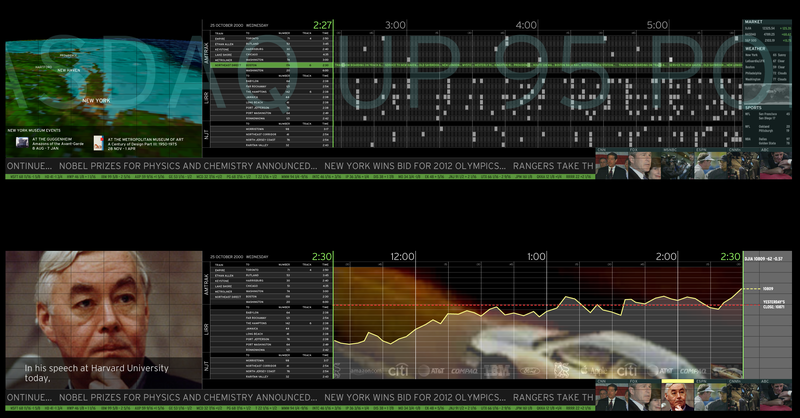 Again – worth noting brilliant past work in this area that’s an influence on this idea. 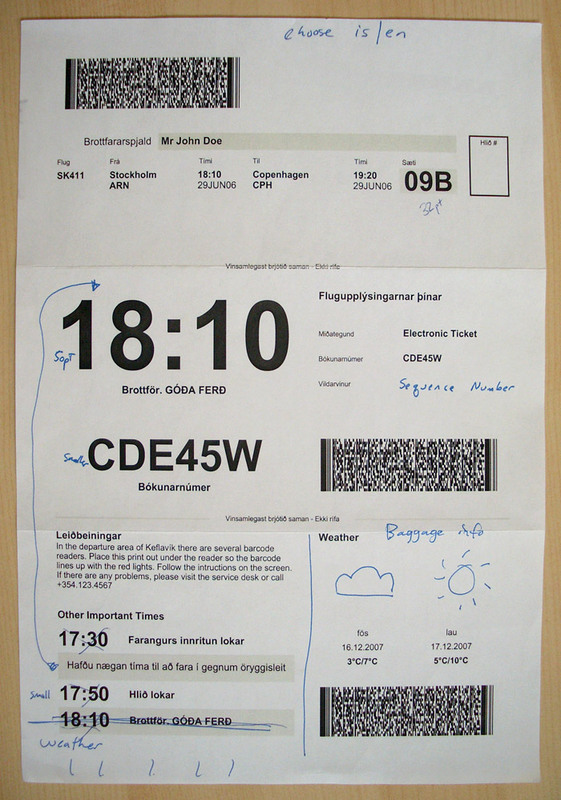 Our friend Brian Suda’s redesign of an airline boarding pass that uses typographical hierarchy of the printed object to reassure and delight. 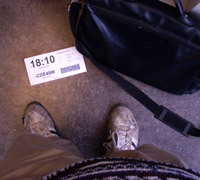 Here you can see that the time of your flight is clearly visible even if your boarding pass is on the floor. We wanted again to examine the idea that print can be nimble and quick and delightful – creating new forms of post-digital ephemera for collecting or talking about. 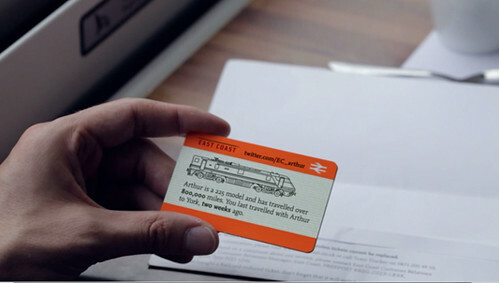 First of all, using the ticket to introduce you again to Arthur, your train, and perhaps extending that to recognising the last time you travelled together. We know that we’re going to be passing certain places at certain times, to some accuracy, during our journey. The burgeoning amount of geo-located data about our environment means we could look to provide snippets from Wikipedia perhaps, with timings based on how they intersect with your predicted journey time – alerting you to interesting sights just as they pass by your window. 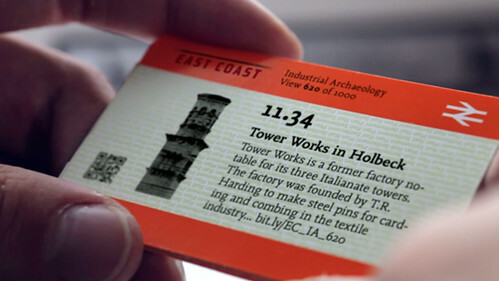 These tiny, personalised, collectable paper-spimes provide a kind of papernet augmented-reality – giving a routine journey an extra layer of wonder and interest. As with “Incidental Media”, we’ve tried in “The Journey” to illustrate ‘polite media’ tightly bound to and complimenting one’s context. Media that lives and thrives usefully in the interstices and intervals of everyday routine and technology – indeed ‘making future magic’ instead of the attention arms race that the near-future of urban screens and media could potentially devolve into. 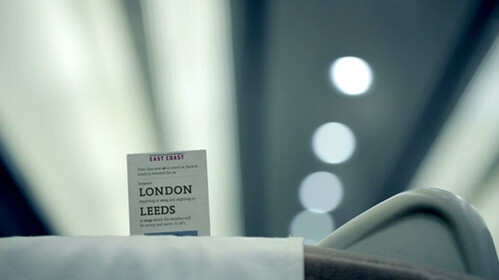 The Journey is brought to you by Dentsu London and BERG. Beeker has written about the films here. Thank you to Beeker Northam (Dentsu London), and Timo Arnall, Campbell Orme, Matt Brown, and Jack Schulze!